Fake news targets Times of India. A photoshopped image of one of its articles goes viral. 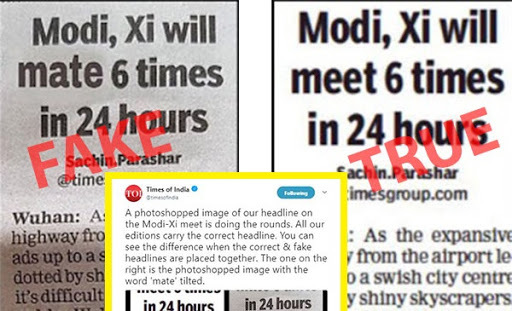 The Times Of India took to Twitter on Friday to clarify that an image purporting to show one of its articles with an embarrassing typo, was in fact photoshopped. The newspaper said all its editions carried the correct headline. BOOM reached out to Derick D’Sa, Associate Executive Editor, the Times of India, for a clarification. D’Sa responed to our email with the URL of the tweet from the newspaper’s official handle. The article by reporter Sachin Parashar counted the number of times Prime Minister Narendra Modi and Chinese President Xi Jinping will be meeting each other in 24 hours. 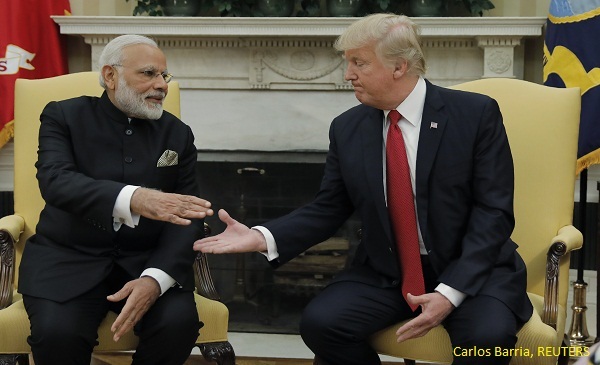 However, the word ‘meet’ was replaced with ‘mate’ and soon enough the image went viral on WhatsApp, Facebook and Twitter. Many on Twitter posted the image calling it out as fake and asked others to refrain from sharing the same. 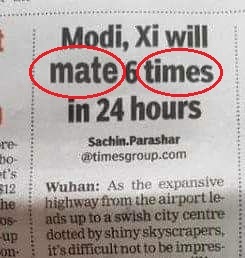 Looking at the image closely, one will notice that the letters ‘t’ and ‘e’ in the word ‘mate’ appear different from how they appear in the word ‘times.’ The white portion around the word ‘mate’ also looks grey compared to the rest of the headline suggesting it was photoshopped. The e-paper version of the story also carries the correct headline. The two-day Wuhan summit commenced on Friday where the two heads of state are expected to discuss issues ranging from trade policieis, protectionism to a border dispute. The publication reported it had filed a police complaint against unidentified persons for mischievously photoshopping the headline. On April 28, Vineet Jain, managing director of the Times Of India group, issued the below warning on Twitter.